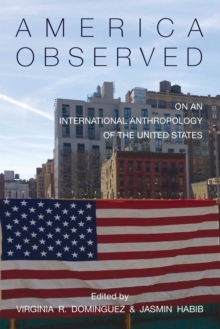 There is surprisingly little fieldwork done on the United States by anthropologists from abroad. America Observed fills that gap by bringing into greater focus empirical as well as theoretical implications of this phenomenon. Edited by Virginia Domniguez and Jasmin Habib, the essays collected here offer a critique of such an absence, exploring its likely reasons while also illustrating the advantages of studying fieldwork-based anthropological projects conducted by colleagues from outside the U.S. This volume contains an introduction written by the editors and fieldwork-based essays written by Helena Wulff, Jasmin Habib, Limor Darash, Ulf Hannerz, and Moshe Shokeid, and reflections on the broad issue written by Geoffrey White, Keiko Ikeda, and Jane Desmond. Suitable for introductory and mid-level anthropology courses, America Observed will also be useful for American Studies courses both in the U.S. and elsewhere.